We received a letter in the mail the other day from the comune (town hall) of Pesaro informing us that we were eligible to receive a Carta Bimbi (discount children’s card) as a gift to celebrate Alex’s arrival into the community. 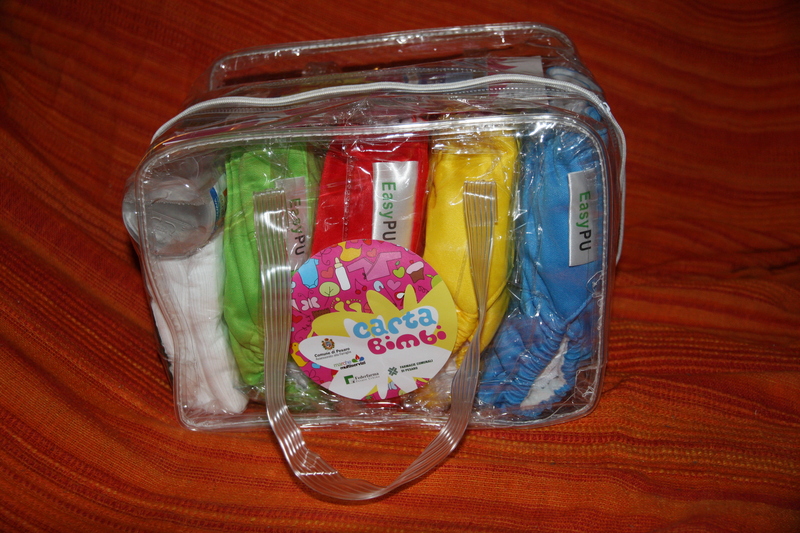 La Carta Bimbi is a project of goodwill sponsored by the comune that aims to promote good health for all families. The discount card is available for all children between 0-12 months, born in 2010 and who are residents of Pesaro. So, we went to the farmacia on via XI Settembre—only due passi from our apartment—and presented the pharmacist with the letter. She gave us the card and explained that, for a full year, we’d receive a 10% discount on baby items in any farmacia; a kit filled with ecologically-friendly detergent, baby wipes and 4 reusable diapers; a 20% discount on taxi services; free bus rides for moms until their babies are 12 months old; 22 free parking passes for strategic zones in the city that are close to pharmacies and pediatric clinics; 4 free passes to a local parking garage; and, if I wish to enroll, I can access certain pediatric and obstetric services for free. I’ll have to check out the reusable diapers . . . I’m all for saving the environment, but using cloth diapers also requires using the washing machine more frequently and wastes a ton of water. But, I might as well try them out. It’s also great that the scale we rent weekly to weigh Alex will now be free. And, did I mention there’s a “Bimbo a Bordo” sticker for our car? It’s more fun than a “Baby on Board” sticker in English. I better save this to use in the U.S. All in all, a very nice gift for new parents! This entry was posted in Italy and tagged comune, farmacia, parents, Pesaro. Bookmark the permalink.